Follow this procedure to tag, filter, and sort customer sites within the Global Site Manager (GSM). Tagging — Allows admins to group sites together based on a shared attribute, called a tag. Tags are assigned to each site. 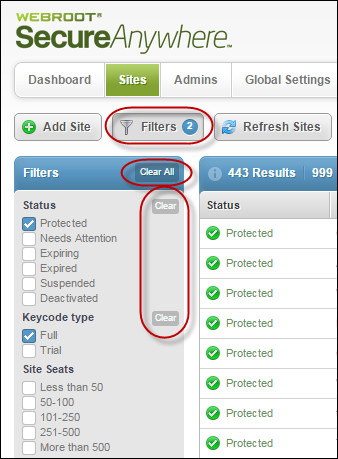 Filtering — Allows admins to filter customer sites with based on the tags that were assigned to each site. Additionally, admins can filter sites based on the site name or site comments. Sorting — Allows admins to sort based on site view headings. Searching — Allows admins to search sites by site name. Paging Through — Allows admins to determine the number of rows each page displays, and to page through when the number of rows exceeds the number determined. Access the GSM at my.webrootanywhere.com. On the site where you want to add tags, click the More Info button. At the bottom of the panel, in the Tag List field, add as many tags as needed. The type of company, such as medical, construction, or transportation. The time zone, geographic location, country, or language. The account manager's name, the IT person's name, or the name of your main contact. Note: You can tag a site as many ways as needed, however, you can only filter based on a single tag. After you add each tag, click the Add button. To remove a tag, click the X to the left of each tag. When you're done, click the Save Tags button. The system displays the Filters menu, where you can select the filters you want to apply. Select the checkboxes for any filter you want to apply, as described in the following table. You can select multiple checkboxes to apply multiple filters. Select any email address of the person who created that site. Note that if there are more than six email addresses, there is a scroll bar to the right of the list. Select any tags that have been created and applied to a site. To hide the Filters menu, click the Filters button. If you have any filters applied, the number of filters displays in a blue circle. To clear all of the filters, click the Clear All button. The Clear All button only displays if you have selected any checkboxes. To clear the filters for a particular section, click the Clear button next to the name of that section. The Clear button only displays if you have selected checkboxes in that section. Note: Click to the right of the heading to display the Up or Down Arrow. The system sorts in ascending or descending order, based on the type of information in each column. For example, lowest to highest number, or alphabetical. In the Search field, enter the name of the site you want to find. If needed, you can enter a partial name, and the system will display all sites that fit that criteria. For example, if you remember that part of the site name was "Brown" but don't remember the rest of the name, enter Brown. The system displays all sites that have "Brown" in the name. When you are done searching, click the X in the Search field to clear it. The system displays all sites. Note: Your performance will improve in speed if you select a number of pages to display rather than selecting All.